For the last few days, a low pressure system has been swirling over Chicagoland. At Sugar Creek, we have had around 3 inches of rain in total. Not all at once, though, but in six hour soakers spaced about 12 hours apart. Wonderful! Believe it or not, these are very busy weeks for a maintenance crew -- in a different way than usual. 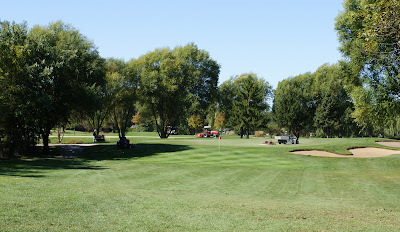 We have not been able to mow fairways, but we have been able to mow everythings else very slowly. Sand traps have been a constant battle. In weather like this, we pump them just to give us a shot at drying them faster after it stops raining. Since you never know when will be the last shower for the week, sometimes we pump them only to have them fill up again. That's just the chance you take. They will be putting nicely once they get a chance to dry out a little. This is Gary's third time pumping traps this week. You can also see him pulling weeds while he waits for the double sump pump arrangement to do its job. Great job, Gary! Gary's daily ritual : Pumping and weeding! Divots taken during the course of regular play are necessary, but these divots were not between the tee blocks and are probably from just one golfer "practicing". Ouch. Looks like we may have one more sprinkle before a nice dry week! It's that time of year again! The greens at Sugar Creek were aerified on September 21 with a deep tine machine that loosens up the ground up to 8 inches deep. Aerifying is essential to the long term health of a green. Here are a few pictures of the process. We try hard not to over-sand them even if all the holes aren't full to the top. It is easy to add more sand later but very difficult to get rid of too much. After testing many spots, the holes almost never interfer with putting after we roll the greens out. At least in my opinion, excessive sand is more difficult to putt on and can delay recovery. At the end of the process, we used a pull behind roller to smooth out any bumps. One of the difficulties of dealing with recently aerified greens is dew in the morning. The next two mornings were too dewy to mow or roll the greens without making them clumpy and unputtable. Instead, we will be brushing and mowing them in the afternoon after they have dried out. They are putting smoothly and especially in the dry afternoon are almost too fast. Some golfers even told me they loved putting them the afternoon after they were done. Others said they liked the challenge of the different speed. I hear a rumor that some golfers are not big fans of aerification, but I haven't run into them yet . . . Well, maybe one or two! Meteorological summer is over and it has definitely cooled off in the Chicago area -- just barely dipped under 50 last night in many areas. The last month has been a busy one at many golf courses in the area struggling to recover from late July's rain and heat. Luckily, August was not extreme: 1.1 degrees F over normal and about average rainfall. This meant that it was possible to get seed to grow in fairway areas. In the last 5 weeks, we experimented with several methods of seeding and aerification in the fairways. We used a slicing knives several times in an attempt to break through the thatch into soil. This worked in some spots. We also used an Aera-vator with a seeder to spike seed and cultivate areas. Other areas we used a Ryan Mataway slit seeder. All three methods worked to one extent or another. The trick is to get seed-to-soil contact without making the situation worse or delaying recovery. Some of the plants you see are not new seed. Most of these areas in our fairways are composed of annual bluegrass, or Poa annua, an annual grass with lots of seed in the ground. It is very aggressive in spring and fall, but often dies in summer. In some of these areas, our new seed may have gotten started early enough to establish before the annual fall resurgance of Poa annua. In others, Poa will likely take back over. Annual bluegrass is not exactly what we want to see because it is the species that died in the first place, but it is turf and you can play golf on it! There isn't any way to stop it without stopping our new seed also, so superintendents have to constantly manage it. Many other areas have already recovered from early August and the rest are filling in quickly. September has really been a nice month! Overall, we have had a lot of success this year replacing pesky Poa annua with bentgrass and bluegrass. Hopefully these seedlings will toughen up before winter and make great turf next year!